In the 21st Century they put the finishing touches to any outfit and are a sign of status and adornment but shoes were originally the simplest way to protect the feet. Early shoes were made of large leaves, bark and grass tied together with vines. The decades have seen progression in the design of footwear so it is the modern shoes that are sought after by collectors. Boots were the favoured footwear for the 19th century, worn by both men and women styles varied from the front laced Balmoral boot to the button boot. Delicate shoes were also worn and made of satin, silk, reptile and leather. The styles were not too different from modern day shoes with mules being popular with both sexes for indoor wear and the classic court shoe being worn from 1860s/1870s onwards. fashionable, almost impossible to walk in. Known as “Barrette” because they were fastened with bars and buttons. 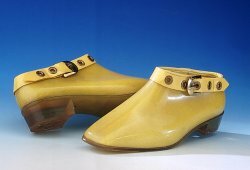 By the 1920s and the “Age of Jazz” shoe design became more prolific. Bar shoes were still popular and brightly coloured fabrics were the height of fashion which reflected in the fancy footwear. The 1930s saw more innovative styles with radical modern shapes being introduced. The middle of the 20th century saw the biggest turning point for shoe design; the 1950s introduced the stiletto heel or “little dagger” as it was also known. A complete turn around from the chunky designs of previous decades, highly collected the retro 1950s is where most collectors start buying. Good examples can still be found around car boot sales and jumble sales for a few pounds – also vintage clothes shops stock many 1950s and 1960s shoes for as little as £50 upwards. From the Rock ‘n’ Roll years into the swinging sixties shoes became a fashion statement. Beatlemania saw the reintroduction of the elastic-sided Chelsea boot, which had been fashionable over 125 years previous. Fashion designers such as Mary Quant, started to experiment with plastics using bright psychedelic colours producing hip and trendy footwear for the fashion conscious. The platform boot dominated the mid 1970s with inspiration taken from the “Glam Rock” pop groups of the decade. The film “Tommy” was released in 1975 and starred “Elton John” as the pinball wizard. The famous boots worn by the star were modelled on “cherry red” Dr Martens, moulded in fibre glass they stand 4ft 6.5″ high. These boots can be viewed at the Northampton museum as they are on loan from R Griggs makers of Dr Martens who purchased them at auction when Elton sold them through Sothebys in 1988. 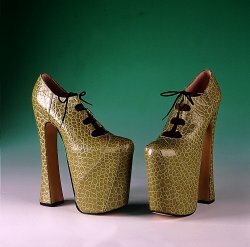 The museum also owns a pair of Vivienne Westwood green mock crocodile super elevated Gillies. M ade especially for the museum they are similar to the blue ones worn by supermodel Naomi Campbell when she toppled over on the catwalk in 1993. Westwood is one of the top names in the collecting world and her products can make large amounts of money on the secondary market. Expect to pay from between £400 to £600+ for a pair, especially those dating from the 1980s. This may seem a lot of money but when you take into consideration a brand new pair of Jimmy Choo’s can cost up to £1,000 from a retail outlet, the vintage ones are a bargain. Modern shoe designer Patrick Cox is constantly aware of the collectors market and produces limited edition shoes for this purpose. Last year an exclusive pair of his Swarovski crystal-encrusted red stilettos was auctioned for “Art of Fashion” and raised £7,000 for Breakthrough Breast Cancer. Other lots included white stilettos by Stuart Weitzman customised by celebrities such as Dido and Sophie Ellis-Bextor, these raised £200 – £220 a pair. 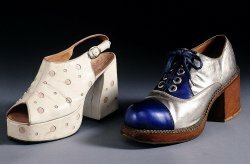 Shoes design has progressed increasingly over the last century with new technology and material available allowing shoe designers to become more innovative and experimental.. Rebecca Shawcross of Northampton Museum’s advice is “shoes will not make you a fortune but buy what you like, wear them and love them”. Judy Garland’s “Ruby Slippers” from the film “Wizard of Oz” made $666,000 at Christies in 2000. The oldest shoe in the world was made 8,000 years ago and found in the USA in a cave.